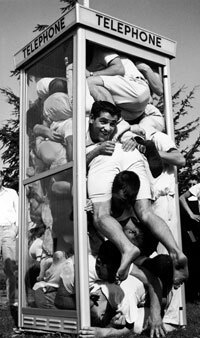 What: An event commemorating the 1959 LIFE magazine photo of 22 Saint Mary's College students crammed inside a telephone booth, aiming for a spot in the Guinness Book of World Records. Teams of Saint Mary's students - more accustomed to iPhones than pay phones - will battle to best the alumni record, squeezing as many team members as possible into a phone booth. The College will also recognize the Golden Anniversary of the memorable moment by acknowledging those who contorted themselves for history's sake. Background: The LIFE photo evolved from a late 1950s international fad of telephone booth stuffings on college campuses. In the fall of 1958 a group of Saint Mary's students crammed into a wooden phone booth to beat the record held by a South African team. Joe Munroe, a Bay Area photographer and freelancer for LIFE heard of the attempt and came to Saint Mary's where 22 students staged the stunt outside. The photo became a classic image of Americana and is part of LIFE magazine's 100 greatest pictures collection. Several former students who overpopulated the phone booth for the 1959 photo are still in the East Bay area and have great stories about the event; one is a professor at Saint Mary's. Fifty years ago the College was all male. However, to acknowledge the Silver anniversary in 1984, the event was restaged with two phone booths, one of which was crammed to capacity with female students. An alumna who participated in the female phone booth jam is now a Vice Provost for Saint Mary's and can help tell their story. Joe Munroe, the photographer who took the 1959 picture - now 92 years old and still active - lives in the area and is a fount of knowledge about how the photo came to happen. Ted Tsukahara, Saint Mary's Professor and alumnus, took part in the 1959 event. Frances Sweeney, Saint Mary's Vice Provost and alumna, took part in the 1984 restaging. College Archive Materials: 1959 home movie footage of students climbing into the phone booth. 1984 photographs of students participating in Silver Anniversary event. The Saint Mary’s College of California experience inspires learning that lasts a lifetime. For nearly 150 years, the College has provided students with a rigorous education that engages their intellect and spirit, and awakens a desire to transform society. Guided by the Christian Brothers, the Catholic Church’s oldest order dedicated exclusively to teaching, the College enrolls more than 3,800 students in undergraduate and graduate liberal arts and business programs. For more information visit Saint Mary’s College at stmarys-ca.edu and just 23 miles east of San Francisco.